Flushing the vehicle engine's radiator is a simple procedure that is offered as a service at automotive garages and drive through oil lube shops everywhere. Often when you go to a drive through oil and lube shop they will attempt to upsell you from a basic oil change to an included coolant system flush as well. Your vehicle's engine does not need to have its radiator flushed every time you change its oil, but once in a while a radiator flush will be of tremendous benefit to your vehicle's motor. When the radiator is flushed all the coolant is drained from the engine's radiator and the engine cooling ports inside the engine and the vehicle's heater lines and heater core. The complete coolant system is completely drained. Then the coolant system is refilled with water only and drained once again and the procedure is repeated until the complete cooling system is clean. The process should be repeated many times until the water being drained from the radiator is clean and has no discoloration whatsoever. Once the coolant system drains absolutely clean the drain valve in the radiator is closed and the engine's cooling system is refilled with antifreeze or coolant which is mixed with water at a 50/50 ratio - 50 percent water and 50 percent antifreeze. 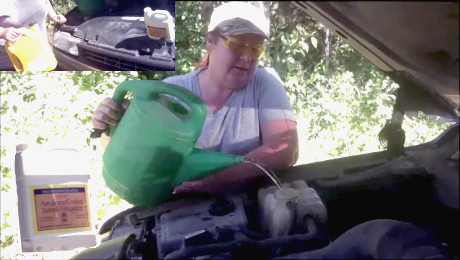 Flushing your vehicle engine's cooling system is something that you can do yourself with a little preparation and some simple tools. Many types of containers will work for a drain pan, but a factory drain pan is most convenient to use. Though many types of containers will work for a drain pan a factory drain pan is the most convenient to use. Your vehicle engine's cooling system can contain over two gallons, 8 to 10 liters, of coolant fluid so a drain pan that will hold that amount of liquid will serve you best. If you decide to use a smaller container, you will have to shut the drain valve to stop the draining of the fluid while you remove the full container and replace it with an empty one. Then, you can reopen the drain valve and allow the draining to resume. 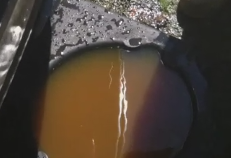 TIP: Coolant is a toxic fluid compound that should not be spilled on the ground and after collected in the drain pan should be poured into a leak proof container and transported to the local hazardous fluid disposal station. Locate the drain valve on the very bottom of the radiator at the left or the right hand side. 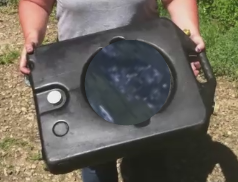 After you have decided on the type of drain pan that you desire to use slide the drain pan under the radiator drain at the front of your vehicle. Your vehicle radiator will have a drain valve on the very bottom either on the left or the right hand side. Locate that drain valve and set the drain pan on the ground centered beneath the valve. Some radiators have a small hose attached to the drain valve and clipped to the side of the radiator while not in use. If your vehicle radiator drain valve has a hose, unclip the hose from its transport position and direct it into the drain pan below before opening the drain valve. 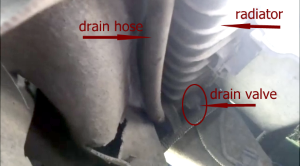 If your vehicle radiator drain valve does not have a section of small hose attached to it, be certain to center the drain pan directly under the estimated path of the fluid flow. This drained coolant is extremely well used and very dirty. Proof that it is in serious need of changing. 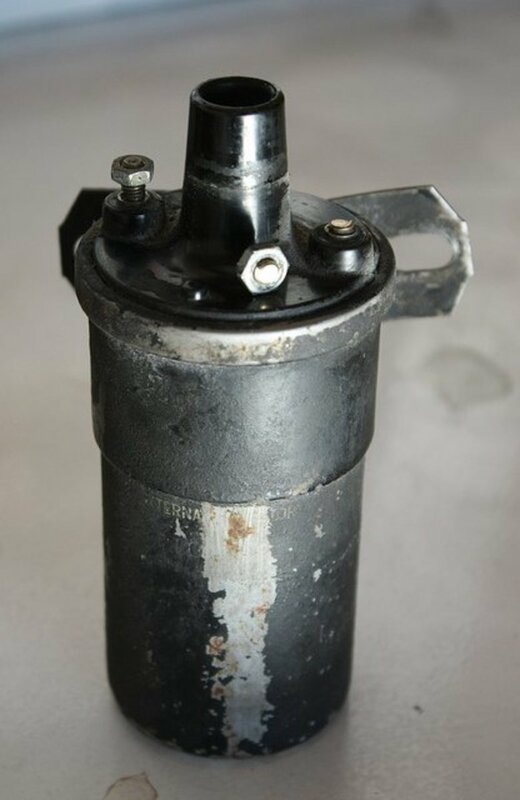 Locate the radiator filling reservoir near the radiator and remove the twist off cap. After placing the drain pan in a good location on the floor open the radiator drain valve and let the old coolant flow out of the radiator into the drain pan. You will need to locate the radiator filling reservoir and remove the twist off cap to allow air to flow into the cooling system displacing the coolant that is being removed. If you do not remove the reservoir cap all of the engine coolant will not drain from the cooling system because the system will become air locked. As the coolant drains from the radiator notice the discoloration - fresh clean engine coolant is a yellow or greenish color - not a dirty brownish color. The coolant becomes discolored because over time the engine coolant is heated and cooled when the vehicle engine is operating or shut off. 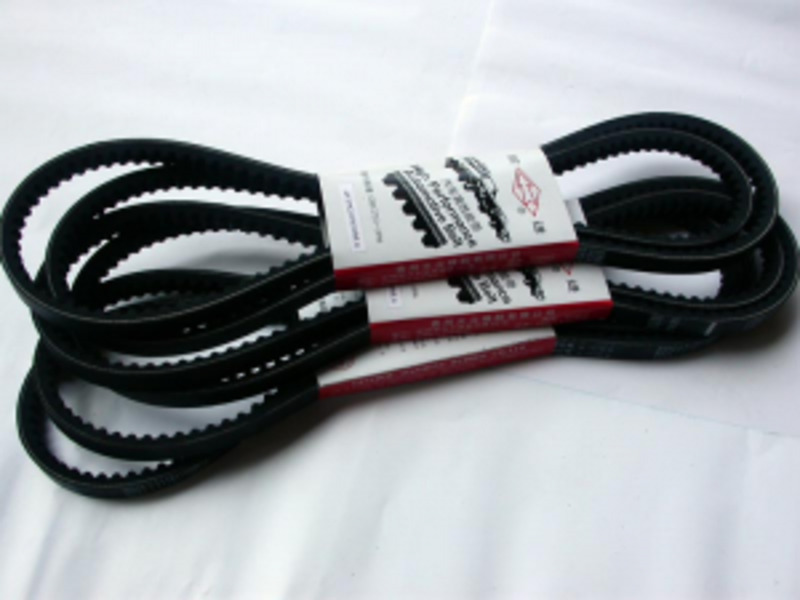 As the coolant is varying in temperature from extreme hot to extreme cold and being circulated throughout the engine cooling system it reacts with the oxidation contaminants that are created through the condensation forming in the metal engine block and the radiator inner tubes and the heater core and its supply hose. This continual reaction creates corrosive compounds which causes the engine coolant to breakdown forming minute particles of sediment that collect inside the cooling system and settle at the bottom of both the heater core and radiator, clogging the internal cooling tubes. Do most vehicle owners get their engine cooling systems flushed regularly? After the fluid has stop draining from the drain valve at the radiator add clean water to the radiator filling reservoir. If the vehicle engine cooling system is not regularly flushed eventually the sediment created from perpetual internal corroding will plug off the tiny tubes inside the heater core and radiator. When those mechanical components become clogged the unneeded expense of parts and labor from having to replace those parts will be inevitable. To begin the engine cooling system flush after the old coolant has been completely drained from the cooling system place an empty container under the radiator drain valve. Close the radiator drain valve and refill the radiator by adding only clean water through the radiator filling reservoir and then start the vehicle engine and let it run. After running for 5 minutes shut the engine off and reopen the radiator drain valve, letting all of the water completely drain out of the cooling system once again. TIP: After the engine has ran for 5 minutes the water in the radiator will be HOT so use extreme caution when attempting to open the radiator drain. Repeat the filling of the reservoir and the engine running and the draining procedure until the water being drained has no color and is completely clean. Continue to repeat the filling of the radiator reservoir and the running of the engine and the draining of the radiator three or four times or until the drain water is without any color and is absolutely clean. TIP: Some mechanical professionals will fill the radiator reservoir with a constant water supply hose while letting the radiator continuously drain. When using a water supply hose and a large drain sump the mechanic will allow the vehicle engine to continue to run as they are flushing the cooling system. They only shut the engine down once the water supply has been shut off. As long as the vehicle engine has water free flowing through the cooling system the engine will not over heat while running. After the vehicle engine has been thoroughly flushed it is time to fill the cooling system with new coolant. Add the new coolant mixture up to the fill level marked on the side of the radiator filling reservoir. After the vehicle engine cooling system has been thoroughly flushed so that the drain water is absolutely clear and clean from contaminants and debris you are ready to refill the radiator with new coolant. 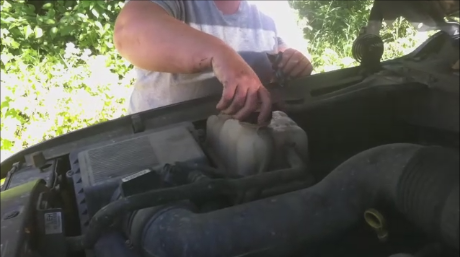 Close the radiator drain valve and re-clip the drain hose back in its transport position. 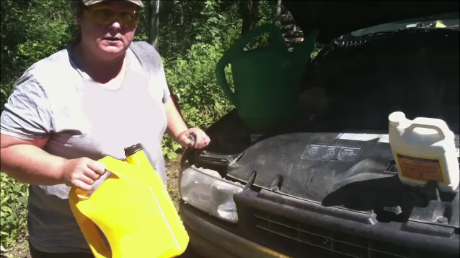 In a clean water jug mix the new engine coolant with water 50/50 or half and half. Add some coolant in the water jug and then add the same amount of clean water to the coolant in the jug. 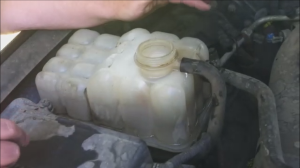 Once you have a 50/50 mixture in the water jug poor the mixture of coolant into the radiator reservoir. TIP: The new engine coolant is readily available for purchase in both premixed at 50/50 and concentrate form as well. If you purchase the premixed coolant you will not have to add any water to the mixture. All vehicle radiators are different sizes and require varying amounts of coolant to fill. The vehicle's owner's manual will state the capacity of the engine cooling system. If you do not have the information stating the capacity of the radiator you can roughly guess how much coolant you will need to refill the radiator by gagging the amount of coolant that was first drained from the system. Be cautious not to overfill the radiator reservoir. There will be a mark on the side of the reservoir showing the maximum fill level. When you first fill the reservoir to the maximum fill level you can start the vehicle engine and let the engine run. After the coolant level in the reservoir is no longer droping put the reservoir cap on tightly. As the engine runs for the first time with the new coolant the heater core and lines will fill and the coolant level in the reservoir will drop and you will have to add some more coolant. Continue adding the new coolant slowly as the engine is running until the coolant level stays at the maximum fill level marked on the side of the reservoir. 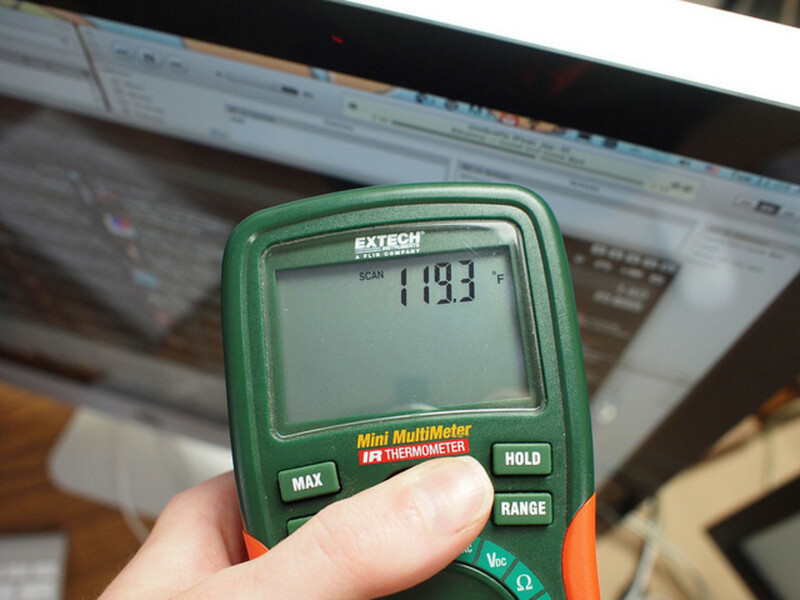 Continue to monitor the coolant level in the reservoir for 5 minutes as the engine continues to run. When you are satisfied that the coolant level in the reservoir is not going to drop any further shut the vehicle engine off. 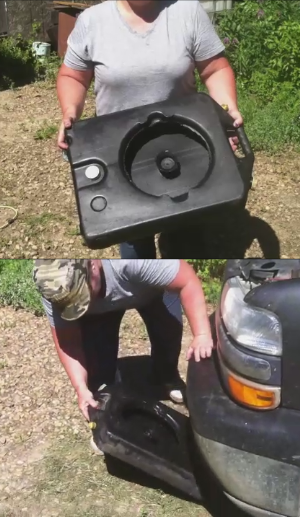 Put the radiator filling reservoir cap on tightly and clean up your supplies. You are done the coolant system flushing job. TIP: Be sure to check the coolant level in the radiator fillg reservoir after operating the vehicle for an hour or more. 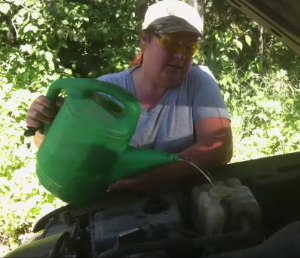 Clean up your supplies and close the vehicle engine hood. You are finished the coolant system flushing job.